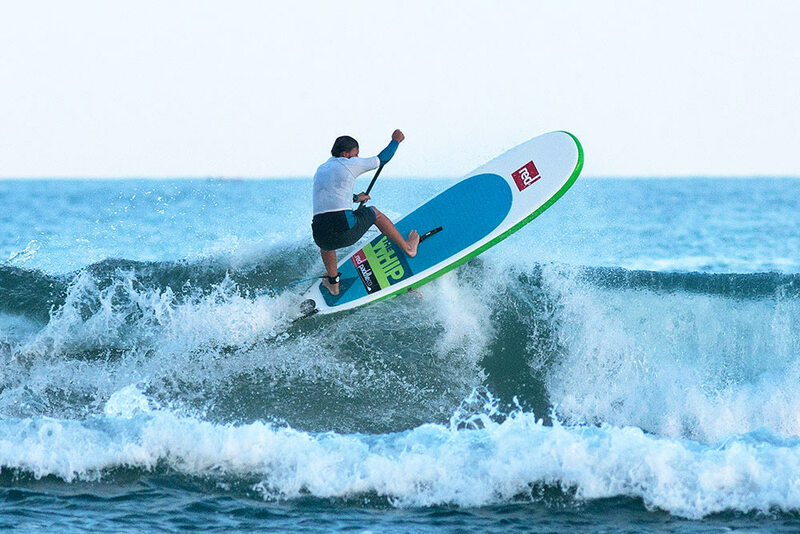 Xavi Masdevall (Spain) has had a fantastic European SUP surf champs, taking the win in the Inflatable division. The conditions were near perfect with 3ft – 4ft clean swell peeling off the sand bars at Cantabria in Northern Spain. Xavi was riding the 2016 Red Paddle Co “The Whip” – the 8’10” shape is the latest design innovation to come from the team at Red Paddle Co.
We’ll done and thank you Xavi! This is a fantastic result for all involved. The Whip is the result of 6 years of shape development. We’ve always said you can’t just copy a hard board shape, as inflatable boards just don’t react in the same way. The lack of thin rails mean we have to find other solutions to generate performance. The Whip’s secret is in its plan shape and fin set up as well as our patented RSS System, which allows us to keep the board at 4″ thick and not lose stiffness – something that is only possible with the RSS system. The Whip also utilises our game changing new MSL material that reduces the weight of the boards by up to 2kgs without reducing stiffness – a first in inflatable design. The 2016 Red Paddle Co range, including The Whip will be launched on Nov 1st. www.redpaddleco.com. Red Paddle Co was founded in 2008. It focuses on building inflatable boards that deliver an authentic paddling experience while still offering the benefits of easy storage and transport. It’s focus on materials and design deliver boards with unrivalled stiffness and performance. The patented RSS system and the new Titan pump deliver performance advantages unique to Red Paddle Co.
Run by paddling enthusiasts Red Paddle Co boards are available in more than 55 countries worldwide. Standup Journal is the world's first and highest quality sup publication that is passionately following and writing about this special lifestyle, the culture, and the adventure and lifelong friendships we share!